The Street Sweeper was invented by a woman in 1900 – Florence Parpart. Born in the Hoboken, New Jersey, Parpart was listed as a housewife in the United States Census for the majority of her life. She didn’t invent the first Street Sweeper (The first street sweeper patent was awarded to Eureka Frazer Brown in 1879) – but it was such an improvement on earlier models that within two years of receiving her patent she had contracts all across the United States to manufacture her design. 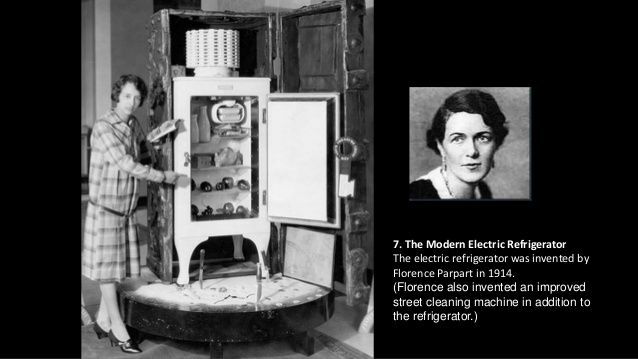 In 1914 Florence went on to patent the electric refrigerator … replacing the icebox! Parpart spent the majority of her life in New York City and Philadelphia, and both cities needed additional street sweepers to keep residential and commercial areas clean. Parpart won her patent in 1900.